Overland Park Chiropractor, Dr. Kadolph believes that your greatest wealth is your health. Dr. Kadolph treats the underlying issue, instead of just the surface symptoms. Chiropractic and Massage combined, release the innate ability of the body to heal itself. 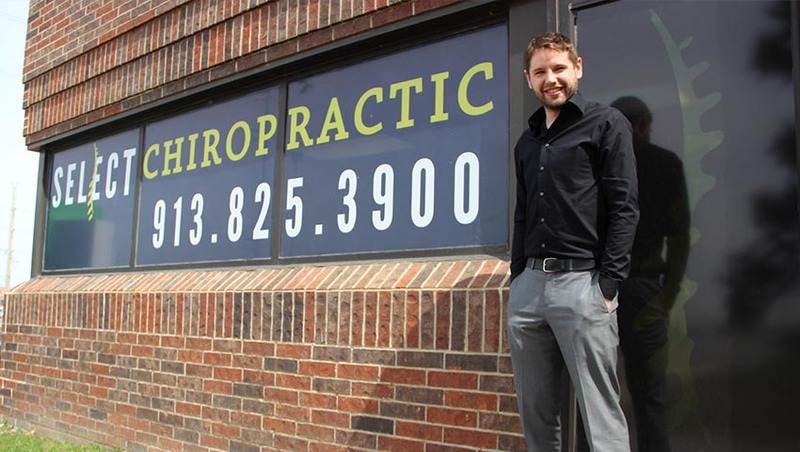 Overland Park Chiropractor, Zach Kadolph DC is an exceptional resource for pain relief and natural healthcare. Chiropractic care is a safe and non-invasive form of therapy utilizing adjustments to relieve aches and pains generally caused by daily activities that lead to misalignment throughout the body. Dr. Kadolph specializes in re-aligning the overall structure of the body through spinal and joint manipulation to reduce these aches and pains in a gentle, yet effective manner. Schedule your Complimentary Exam and Consultation with Dr. Zach Kadolph at Select Chiropractic, to find out how Chiropractic care can better your health and quality of life in general. Dr. Zach is awesome! I've been to several different chiropractors and he truly is the best! 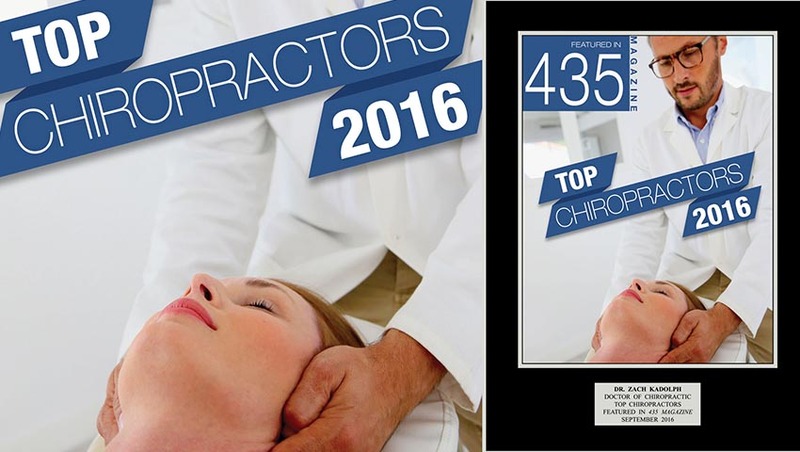 He is completely transparent with his pricing and treatments which truly differentiates him from other Chiropractors that I've been too. You'll go in knowing exactly what to expect and will walk out of there feeling a lot better and a lot happier." I have been seen Dr. Zach for the past 4 years and he definitely knows what he is doing! Third generation Chiropractor, he has a great compassionate touch and always makes my neck feel better. He is also fantastic with children! My 11 year old son has had eczema and contact dermatitis since he was a baby. Coming to see Dr. Zach on a regular basis changed his life. My son's skin is significantly better and now he and his little brother ASK me to come to Select Chiropractic! Excellent First experience at a Chiropractor. Not knowing what to expect I was pleasantly surprised. I would say the best quality of Dr. Zach is that he listened intently and took notes as I described my pain. During treatment he focused on all the areas where I had pain and explained exactly how he planned to treat them. He also explained things I could do at home to continue and improve my shoulder pain. I am happy to say that my pain has completely subsided and I continue to see him regularly. Great office with friendly and professional staff, easy to schedule appointments with evening hours that work with my busy schedule. I recommend to all of my co-workers, family and friends." Dr. Zach Kadolph is the best in the game! As an avid cyclist, I am often exposed to discomfort and back pain from long days on the bike. Being able to work with someone who has a strong understanding of athletes and their needs is greatly appreciated. I have had nothing short of a great experience every time that I have visited Select Chiropractic. Dr. Kadolph is experienced, professional, and personable. He engages patients in their care and is happy to collaborate with other health care providers to ensure each patients' optimal health and wellness. His holistic approach to care is just what the doctor ordered!" Yes! Chiropractors are in fact doctors and are licensed in all 50 states as Doctor’s of Chiropractic (DC), they are portal of entry care provides, fully trained to see patients without referrals. Their education alone speaks for itself. If Dr. Zach Kadolph does not adjust you or you do not wish to be adjusted on the first visit to Select Chiropractic Kansas City, he has an array of therapies to help ease your immediate pain other than manipulation. At Select Chiropractic - Kansas City, Dr. Zach Kadolph recommends beginning with a Complimentary Consultation and examination to be able to better understand your goals, health history, and establish your needs.